It’s recipe swap day! Sarah at A Taste of Home Cooking picked game day foods as the theme for this round, which got me super excited. I adore football season and love making up trays of appetizers for game-watching on Sundays. I’ve made jalapeno poppers before, but they’ve always been the battered-and-fried version. These were much different – but I ended up liking them better. Lined up against our usual fried fare, these were a nice change. Want to see what everyone else made for the swap? Check out the links below. Pre-cook the bacon until just underdone. Set aside. Slice jalapenos lengthwise, and then near the stem to make a “T”, to remove seeds and membranes. Make sure you keep the stems intact. In a large bowl, mix together the cream cheese, sun-dried tomatoes, basil, onions and salt and pepper to taste. Fill each jalapeno with the cheese mixture. If you’re using larger peppers, you should be able to spoon it in – using a piping bag may be helpful for smaller peppers. 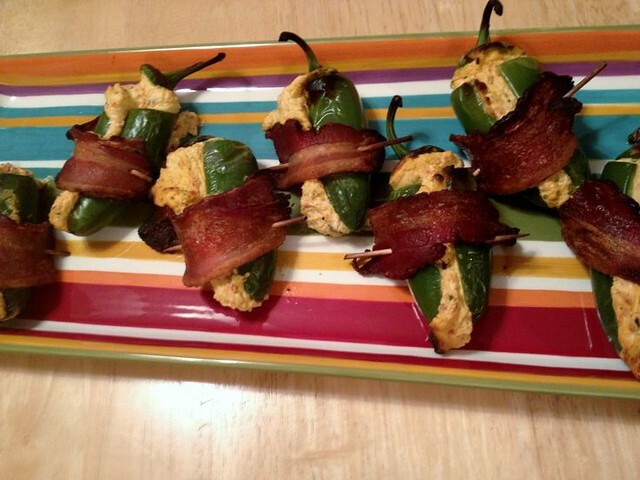 Wrap each filled pepper with a slice of bacon and secure with a toothpick. Broil for 10-12 minutes until bacon is crisped and cheese is bubbly. Let cool slightly before serving. Linked up with Eat at Home’s Bacon-Fest. How interesting to include sun-dried tomatoes! I’ve only had one stuffed jalapeno that I liked, but this one looks intriguing. Nice picture and love the addition of sun dried tomatoes. Yum!